Lower back strain is a common complaint - something most people experience at least one time in their life, and is caused by overuse or overstretching the muscles in the lower back. People who are active and those with stronger core muscles generally suffer less back pain than others. Proper, frequent exercise can stretch the muscles safely, which strengthens them so they are at less risk of strains or spasm. What happens all too often with a pulled lower back muscle is that an individual will begin favoring their opposite side which immediately adds another area of stress to the body. Alternatively, the lower back strain may be caused by another injury or condition. For examples, a hamstring pull may cause you to limp putting strain on one side of the lower back. If allowed to continue, the pulled muscle effect will spread and cause more distress. 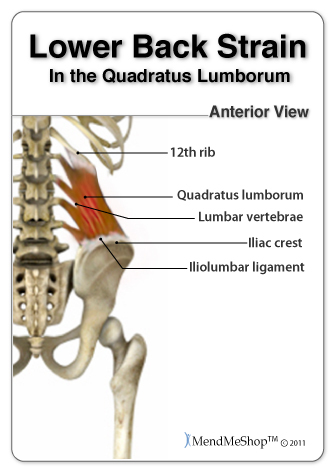 When lower back pain occurs it is natural to avoid using the muscles. As a result, if lower back pain lasts for longer than 2 weeks it can often lead to weakening of the back muscles. Weak back muscles can cause further pain and lead to a cycle of chronic lower back pain and weakness. Fortunately, the back muscles naturally receive a good supply of blood to deliver the nutrients and protein that are needed for healing. But the amount of blood can be limited when you stop moving to give your back the rest it needs. Finding a way to increase blood flow while resting your back is ideal for faster healing, stronger muscles, and less chance of chronic back pain developing. An injured back will receive less blood flow volume than if it was healthy; this occurs because swelling and inflammatory symptoms restrict that blood flow. 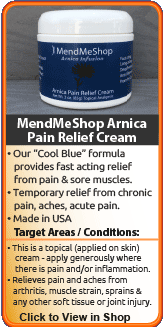 If you are experiencing pain and swelling in the very early stages of a back strain (first 48 to 72 hours), the first step in a conservative treatment protocol would be to focus on reducing the discomfort by applying a quality cold pack to the injured area along with a high quality pain relief cream such as our Arnica Infusion Cream. after any activity that stresses the back in a moderate way. It is wise to quickly apply cold therapy to not only reduce the pain, but to also minimize tissue damage that may have occurred during the prior event. If you have a job that requires you to place some demands on your back. If that is the case, use cold therapy immediately following work and if the opportunity allows - use it for 15 to 20 minutes during lunch or another break time. If you are in a post-operative situation where cold compression therapy would be utilized heavily for at least the first few weeks following the procedure. Similarly, if you are scheduled for upcoming surgery, then you will find a Cold Compress or Ice Pack helpful as well. Often, however, too many people over-focus on cold therapy while ignoring the most critical aspect to healing - nourishing the injured tissues with a healthy supply of blood flow needed to repair and rebuild injured soft tissue. This leads to the most important recommendation - Stage 2. Even though the concept is simple, improving blood flow to injured tissues can be difficult. When the injury is back related, the challenges are extreme. Traditional methods require your muscles and tendons to move to promote blood flow (exercise), but that same motion that promotes blood flow can at times lead to making your pain and condition worse. 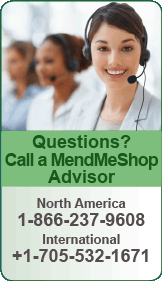 Have you reinjured your back by getting back on your feet too quickly? How many times in the past have you aggravated your back just trying to perform basic tasks around the home? 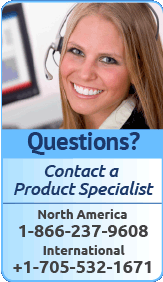 Is your debilitated back preventing you from work or activities you love to do? The real challenge is how do you promote blood flow to the lower back site without causing further injury? This goal is further complicated by the fact the back (and muscles controlling the torso and hip) is involved in pretty much any physical movement we make each day. Electromagnetic energy is a form of energy will easily penetrate through clothing, skin, and fatty tissues... directly into your injured muscles and soft tissues within the back. After the energy absorbs into the back, the metabolic response then kick starts the repair and rebuilding process. Research is continuing and soon, much of North America will know what the Far East and Europe has known for a long time; electromagnetic energy provides a wide range of health benefits for those not only suffering from back injuries, but for many other soft tissue ailments (plantar fasciitis, bursitis, tendinitis, Tenosynovitis, frozen shoulder, golfer's elbow, tennis elbow, hamstring strain etc.) as well. The best option we came across in our research to accomplish true healing of soft tissue injuries in the back is the Back-Hip T•Shellz Wrap®. Use of this device results in a dramatic increase in blood flow to the injured tissues located deeper within the body - all in a non-invasive manner. Have you seen what happens when you add water to a flower wilted from drought? In essence, your injured back is much like a "wilted" flower; your body wants to heal its injury, but needs lots of nutrients to do it. Blood brings new life to your cells by delivering healing nutrients and oxygen that are vital to your tissue. In addition, the blood carries away toxins and cellular waste cleaning the area and healing it faster. Without a good supply of blood, your back simply won't heal in a timely manner like it should. The Back-Hip T•Shellz Wrap® is based on the scientifically validated principle of Electromagnetic energy as we discussed previously. This form of treatment is safe and effective as shown in numerous studies which can be referenced through the National Library of Medicine. Professional athletes and those in the medical field have been users of the technology for decades - it really hasn't been until recently that companies like ours introduced these devices to the home user. Using the T-Shell Wrap is truly a unique experience. Within moments of applying a treatment to your injured back, you can feel the sensation due to the increase in blood flow deep within the area. During a treatment, and for quite some time after you finish, the treated area will feel relaxed and warm. It's a very soothing sensation and extremely effective. If you have injured your back, groin, hip or other soft tissue in your torso, then you would find the Back-Hip T•Shellz Wrap® to be a great home treatment tool. If you have a chronic back, groin or hip condition that has lasted for years- this device will help start the rebuilding process and help strengthen the surrounding and supporting tissues. Many of our past clients had suffered for years, then were completely amazed at the results only after a few months of treatments. If you are still working with an injured back, the T•Shellz Wrap® will help relax injured soft tissue prior to work and after a day at the job. If you are suffering from hip bursitis and want to treat the major source of it (secondary damage to the muscle and tendon surrounding the bursa sac). Through overuse or degenerative changes in the hip, the muscle and tendons surrounding bursa sacs will tighten and constrict. When they do, they place pressure on the bursa, causing it to become irritated. Applying a soothing and deep penetrating energy to the lower back and/or hip relaxes soft tissue and takes pressure off the bursa. T•Shellz Wraps contain a unique Carbon Fiber Energy Pad which is flexible and will shape to conform to your body. This Energy Pad emits a uniform wave of perfectly safe electromagnetic energy over its entire surface. This energy travels DEEP inside to muscles, tendons and ligaments, stimulating blood flow your own body needs to heal your injury. It is the electromagnetic energy that is crucial to the healing process. 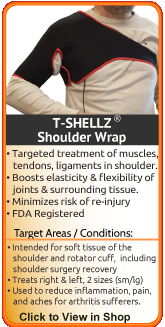 What Else Makes the Back-Hip T•Shellz Wrap® So Special? 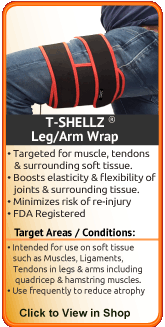 We believe the T•Shellz Wrap® to be one of the most effective treatments to increase localized blood flow to dense, injured tissues such as muscles, tendons, ligaments, and other similar tissues. The T•Shellz Wrap® has a special signal controller that can be set for 3 different power levels of application (3=High, 2=Medium, 1=Low). The cord is long enough that you can sit or lie comfortably and watch TV, read or surf the net while you're using it. 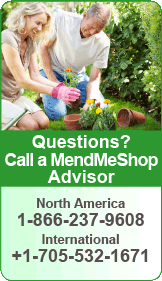 Dealing with aches and pains affecting the back, hip, thight, groin, knee, hamstring, arm, shoulder, elbow, wrist, or hand? If so, then applying the Arnica Infusion to any of these targeted areas will bring about fast relief from the pain and sore tissues. Simply apply a small amount of cream to the body and moments later, you will experience a soothing and comforting sensation over the area. Since you are reading this, you probably know that serious back or hip injuries do not just disappear. Over time, they usually wreak havoc on your body - usually your knees and ankles, due to lack of movement and over-compensation. Recovery takes a longer time for such chronic (long term) injuries, but proper healing is essential to regain strength and get you back to the activities you enjoy. Everything in the human body is connected. A Back Pull or Hip Bursitis injury can lead to other injuries over time if not treated properly. For example, one or even both of your knees may start seriously hurting due to a change in your gait. On-going pain in this area could potentially result in knee strain, pulled calf muscles or achilles tendonitis. When you experience pain in areas of the body due to a change in body mechanics that is driven from your back pain or hip pain, this is something called "over compensation" pain. Over time you may also permanently change the way that you walk due to chronic back or hip pain. If you change the way that you walk, how you get in and out of a car or even the way you climb a flight of stairs you WILL irritate other joints - they are taking on a bigger load due to overcompensation. On-going injury, chronic conditions and over compensation pain are all reasons why it is important that you remain proactive in your recovery. This is why it's also critical to completely heal your back and hips before returning to activity. If you don't focus on healing your injury quickly and completely you run the risk of interrupting your lifestyle in a major way. A Deep Tissue Therapeutic Back-Hip TShellz Wrap to increase blood-flow to the injured soft tissue in your back and hip (Deep Tissue Therapy Therapy). An Exercise & Stretching Plan to prevent muscle atrophy and shortened tendons. A proper plan will increase elasticity and strengthen the muscles of the back and tendons of the hip. Conservative treatment tools just like these have been used successfully by thousands of back and hip injury sufferers - just like you.